Rackspace Hosting (NYSE: RAX) shares moved up 16.98% to $35.89. The volume of Rackspace Hosting shares traded was 1289% higher than normal. Rackspace Hosting surged on confirmation of approach by potential buyers and partners. 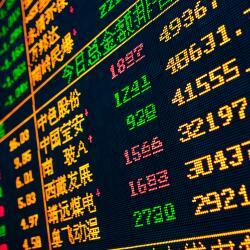 TAL Education Group (NYSE: XRS) shares rose 5.54% to $21.34. The volume of TAL Education shares traded was 1156% higher than normal. TAL Education priced offering of $200 million convertible senior notes. Nordstrom (NYSE: JWN) shares climbed 11.82% to $68.76. The volume of Nordstrom shares traded was 440% higher than normal. Nordstrom reported upbeat first-quarter results. Nordstrom posted a quarterly profit of $0.72 per share on revenue of $2.93 billion. However, analysts were expecting a profit of $0.68 per share on revenue of $2.86 billion. Analysts at Credit Suisse upgraded Nordstrom from Neutral to Outperform. ICICI Bank (NYSE: IBN) surged 7.91% to $50.04. The volume of ICICI Bank shares traded 238% higher than normal. ICICI Bank's PEG ratio is 0.70.